I would like to introduce you to a new skincare line inspired by a medical doctor’s commitment to changing the way we treat our skin – VOLANTÉ Skincare. Dr. Elizabeth VanderVeer created VOLANTÉ Skincare under the philosophy that skin should be given the same care as internal organs in the body. The first three launches of the skincare line are the Intensive Repairing Serum, Restorative Night Crème and Transformative Eye Crème. I have been using the amazing Restorative Night Crème for about a week now. I use it at night after cleansing. I love the pretty blue tint that the cream has to it, and the texture is nice and rich, yet not greasy. It absorbs perfectly. My skin looks refreshed, well-rested and radiant! I have definitely noticed that my skin looks much firmer, too. I love this cream! 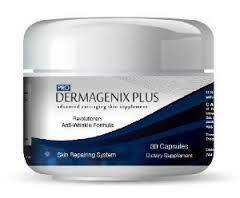 ProDermagenix Plus has developed a skincare supplement to help you beautify your skin from the inside out! This formula provides an intense high potency combination of nutrients, which are thought to help promote healthier and younger looking skin. Included in ProDermagenix PlusTM is Collagen, the primary protein found in connective tissue, along with Hyaluronic Acid, the same nutrient injected by dermatologists to help reduce wrinkles. ProDermagenix PlusTM also attacks the damaging free radicals in the body with an intense blend of antioxidants including Green Tea, Grape Seed and Alpha Lipoic Acid. Resveratrol - Promotes a healthy DNA in our skin that can motivate our cells into restoring themselves. Collagen - Found normally in 90% of our tissues through out our bodies which assists in the building blocks of connective tissue in keeping with healthy skins cells. One of the main functions is to unite layers of skin tissue keeping with an appearance of youth. Grape Seed - Acts as an anti-oxidant in transporting waste substances out of the skin so that other functions of the skin can take place to restore the cells and membranes. Hyaluronic Acid - Used to maintain fluids that transport nutrients for skin tissues and prevents drying affects that cause wrinkles. Hyaluronic Acid is highly important in allowing movement of the tissues so that healthy cells can continue to be active. I received a sample of ProDermagenix Plus Anti-Aging Skin Vitamins to review and I have been taking them for one month now. I have certainly noticed a difference in the way my skin looks. It seems to have a radiance that it lacked before. Any lines I had are so much less noticeable. My skin feels soft and my nails are stronger. I love knowing that I am helping my skin to fight aging from the inside out. It is no secret that I absolutely love and adore skin care products. I go completely nuts over the opportunity to try something new when it comes to beauty products. I got the opportunity to try out CellCeuticals Skin Care line, and once again, I am enamoured. Extremely Gentle Skin Cleanser- which is an extremely gentle one-step skin cleanser which effectively removes daily impurities and eye makeup without irritating eyes or stripping skin of essential moisture. Gentle enough for even the most sensitive skin. I love the way my skin feels after using it. My skin feels very soft, pure and fresh. Cell Genesis Regenerative Skin Treatment- This is a super-potent regenerative skin treatment with exclusive and patent pending GFP Cellular Complex acts as a cellular stimulant to encourage the regeneration of new surface cells for visibly younger skin. After just four days of using this treatment, I really see the benefits. My skin has taken on a more supple and youthful appearance. I am excited about this! Extreme Defense AntiCell Damage Skin Treatment- A powerful antioxidant treatment which defends skin against age-promoting free radicals. I love the texture of this product. It just makes my skin feel amazing. Again, I am excited to see how this will work for me. CerActive Active Moisture Barrier Skin Treatment- A deep moisture and barrier repair treatment which soothes skin and provides long-lasting hydration. I love how this product gives a cool sensation to my skin. It is like I can almost feel it working, so I know it is doing great things for my skin. Very nice! NeoCell Micro-Resurfacing Skin Treatment- This product has natural enzymes and volcanic micro-minerals which gently resurface skin without irritation revealing smoother, radiant, and healthier looking skin. I LOVE this product! It feels amazing, and after I use it, the products I use seem to absorb even better because I am providing my skin with a clean slate. I am so very pleased with the results I am seeing after only four days of using CellCeuticals. CellCeuticals® Skin Care, Inc., a cosmeceutical company founded in 2007 by internationally renowned plastic and reconstructive surgeon DR. GARTH FISHER and beauty industry veteran PAUL SCOTT PREMO, develops technologically advanced, clinically validated, premium skin treatment products under the CellCeuticals® Biomedical Skin Treatments brand. The company’s purpose is to become a global leader in the research and development of innovative products based in biomedical technology that target skin aging. To WIN a set of the products I am using (as described above) valued at $120.00 just fill out the Rafflecopter form below. Good Luck! I received a set of the products mentioned above to review and to keep. All opinions are my own. Apothederm is probably one of the best anti-aging skincare lines I have ever experienced. Their effective formulations treat your underlying conditions to restore and maintain the health and appearance of your skin. Apothederm uses patented SmartPeptides™ allow their products to specifically target your areas of concern such as crow’s feet, laugh lines or stretch marks. These peptides give targeted results – they act as cellular messengers to help stimulate and restore critical functions. I love this company. Apothederm sent me some generous samples of their finest products to put to the test, and each one has proven incredible results for me, (I am very impressed with the stretch mark cream) my mother (who cannot get enough of the firming serum) and even my daughters (who love the cleansers.) We are all very impressed. I have stretch marks that I received from my first pregnancy (18 years ago, thanks Mother Nature) I had given up on them, because they were OLD! After using the Stretch Mark Vanishing Act for two weeks, I was almost shocked to see that they actually diminished! I can't wait to see if they will vanish completely. I love how moisturized and firm my skin is now on my thighs. This product is incredible! Our Apothederm™ Stretch Mark Cream reinforces the skin’s fundamental support structures and helps to visibly repair existing stretch marks. This fast-absorbing lotion is formulated with our patented SmartPeptide™ technology and helps build collagen while reducing the appearance of red and silver stretch marks, all while smoothing your skin’s texture. My sweet mother, who is 64 years old has been 'in the market' for a skin-firming serum for a while now. She kept ordering those 1-800 'so-called' miracle creams and serums that they sell on t.v. that promise great results but do not follow through. She had never 'fallen in love' with a firming serum until she tried this one. Her skin is so much firmer in just three weeks of using Apothederm's Firming Serum. Her skin certainly looks much firmer, and the sagging she was concerned with on her neck appears much tighter. This luxurious serum hydrates and protects your skin while reducing visible signs of aging. We like to call it a more graceful way to age. Apothederm™ Firming Serum is formulated with powerful botanicals and other advanced ingredients to help refine skin. We have added two of our exclusive patented SmartPeptides™ to help firm skin and reduce the signs of aging. I really don't know what it is about this serum that makes it so wonderful. Perhaps it is the way my face and neck area just seem aglow with renewed radiance. That is the best way I can describe this amazing product. I apply it right before I use my daily moisturizer or bronzer, and that seems to be all that I need for the day. I don't even bother with foundation when I use this. It is not a make-up and does not cover anything, but it certainly seems to give my skin a beautiful glow! Apothederm Bright Skin Serum reduces Visible Signs of Aging. This specialized formula refines, brightens and hydrates for a more even complexion. Our SmartPeptide™ technology specifically targets impurities to refine blotchy, discolorations and imperfections. Your skin will look and feel rejuvenated and radiant. It even clears pores and adds needed moisture. My teenage daughters and I all agree that this moisturizing cleanser is wonderful. It removes all makeup (even eye makeup.) Our faces feel perfectly clean after using it, as well as soft and not at all too dry. Of course, my daughters don't need an anti-aging product, but it is gentle enough for their youthful skin. Remove make-up, dirt and impurities from your skin without stripping out any moisture. This cleanser will help protect your skin from damage and free radicals, and your skin will look refreshed and soft. I keep this amazing facial cleanser in the shower. I love to use it at the end of the day to just scrub my face with, using a washcloth and avoiding the eye area. It has an exfoliating effect to it, so I feel that my skin is getting a deep cleaning. I love it! Our Brightening Cleanser not only cleanses your skin, it also refines, brightens and tones. Formulated with malic acid and vitamin C, this cleanser helps loosen dead skin cells and hydrates your skin. In summary, I am delighted beyond measure with the results I have experienced (as well as my mom and my girls) with Apothederm products and I would highly reccommend them to EVERYONE who is looking for a wonderful skincare line that truly works wonders! To purchase any of the above products, just clink on the links I have provided. Note: I have recieved samples of the products mentioned above to review and to keep. The opinions are my own. RoC Skincare was created to help you look ten years younger. Using the power of Retinol, RoC Skincare products have the ability to help turn back the hands of time. Retinol is pure vitamin A, which scientists have proven to be highly effective in fighting the signs of aging. Retinol is used to renew and rejuvenate the look of skin. It has been shown to help smooth fine lines and deep wrinkles, even skin tone, reduce the look of mottled pigmentation, and improve skin texture. Retinol even helps pores appear smaller and less noticeable. Early use of Retinol products can actually help to combat fine lines and wrinkles before they become apparent, so your skin stays looking younger and healthier. Start SlowlyUsing Retinol is like exercising. You don't start out running a marathon. Begin by applying a small amount (a little goes a long way) every other day for about two weeks. After two weeks, you may begin applying more frequently until find the best routine for your skin. It is important to be consistent, as the benefits of Retinol are seen over time. If you happen to experience minor skin irritation, this may be temporary while your skin adjusts to the products. Just decrease usage for a few days and work your way back up after that. texture of my skin after only a few weeks. Which RoC Products did I use and what results did I get? Deep Wrinkle Daily Moisturizer SPF 30 contains the proper sunscreen for a day in the sun. I actually used it when I played outside in the snow with my little boy. I blended it with a bit of bronzing powder (a must for me) and I felt that it allowed my skin to breathe, yet kept it supple all day. Eye Cream . It helps reduce puffiness and dark circles. It does not feel greasy, and I like that. I don't want my eye makeup running. Deep Wrinkle Filler works after four weeks to fill in any deep creases you may have. Again, I have to be honest, I don't have any deep wrinkles yet, but I did feel that I had absolutely zero smile lines after using this. This breakthrough, dual-action formula is specifically designed to target wrinkles, with an exclusive fusion of hyaluronic acid and pure RoC®RETINOL. Deep Wrinkle Serum I love the lightweight feel of this formula. I am very cautious of my neck and my chest skin remaining wrinkle-free, and this product can be worn under makeup or before moisturizing at night to combat fine lines and deep wrinkles. Deep Wrinkle Night Cream is a truly wonderful night cream that feels like an indulgence. It is designed to work through the night when skin is believed to be most receptive. As you apply, the upper layers of your skin are firmed, leading to a visible reduction in expression lines. Then, throughout the night, the formula works to smooth even your deep wrinkles. Instant Facial Smoother. This product is the perfect primer for your daily concealer or foundation. It smoothes the appearance of fine lines, wrinkles, and imperfections, all in all creating a luminous appearance to your skin. I felt radiant, like I had a bit of a glow. Very nice, indeed. All in all, I give RoC Skincare a great big 'thumbs up.' A great skincare product line with important ingredients that ARE proven to fight signs of aging. You can purchase RoC Skincare products from your local retailer, too! Note: I recieved samples of the products listed above and the opinions expressed are my own.